producer l writer I mixer I engineer ... not the dead goalie! History: "I always wanted to play in the NHL but I figured that I already have my name on the Stanley Cup 4 times so why beat a dead horse. Could be worse... I could have been named after Gump Worsely," says Sawchuk. Originally from a small paper mill town in the northern part of Ontario Canada, Terry started writing songs at age 16. It wasn't long before he started composing original music for highschool musicals and started a garage band in his brothers basement. At age 21Terry left home for the big smoke of Toronto to pursue music. "I remember having this idea at 18 that I wanted to be a Producer. I wasn't even sure what a Producer did". Once in Toronto Terry enrolled in The Harris Institutes for The Art's. There he got his first taste of engineering and music business studies. 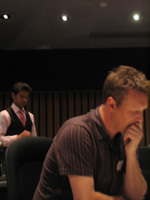 His first few breaks came in 1991 when he landed the job of engineer at Arnyard Studios in Toronto. 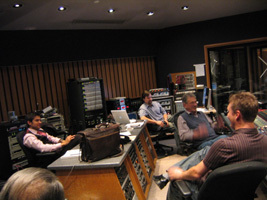 Between '91-'95 Sawchuk helped record such albums as Our Lady Peace's "Naveed" and "Clumsy" (Columbia/Sony), among others. In 1994 Terry co-wrote one song with Alanis Morissette and producer Glenn Ballard. "Superstar Wonderful Weirdo's" went as far as being recorded and mixed during the "Jagged Little Pill" sessions. Universal Music Canada signed Sawchuk and his alternative rock project The Miller Stain Limit to his first major label deal in 1997. At age 27 Terry produced, engineered, mixed and co-wrote the album "Radiate" which featured the top 20 single "Cellophane". Current Credits: Terry is in the studio co-producing with Decca/Universal artist, Matt Dusk. They're working on Matt's new release called "Back In Town" slated for a May release in Canada and Europe with the U.S. release coming in early 2007. Earlier Terry co-wrote two songs for Dusk's debut titled "Two Shots" featuring some of Britain's top songwriters including Bono of U2 who penned the title track. - Tomi Swick (Warner) Radio Single "A Night Like This"
- Ron Sexsmith (Maple/Universal) Radio Single "How On Earth"